Originally, Native American beads were carved from natural materials like shells, coral, turquoise and other stones, copper and silver, wood, amber, ivory, and animal bones, horns, and teeth. Glass beads were not used until colonists brought them from Europe 500 years ago, but like horses, they quickly became part of American Indian culture. Today glass beads, particularly fine seed beads, are the primary materials for traditional beaders of many tribes. There are as many different Native American beading traditions, designs, styles and stitches as there are tribes and nations. Plains Indian beadwork is the best known, with its intricate peyote stitch beading and bone hairpipe chokers, but there are many other kinds of beadwork traditions throughout North America: from the wampum belts of the eastern Indians to the dentalium strands of the west coast Indians, from the floral beadwork of the northern Indians to the shell and turquoise heishi bead necklaces of the southwest Indians. American Indian beads were a common trade item since ancient times, so it wasn't surprising to see abalone shells from the west coast in Cherokee beadwork or quahog wampum from the east coast in Chippewa beadwork, even before the Europeans arrived and forced disparate tribes into closer contact with each other. As a great generalization, native beadwork can be grouped into beaded leather (usually clothing, moccasins, or containers) and beaded strands (usually used for beaded necklaces and other jewelry, but sometimes also as ornamental covering to wrap around a gourd or other ceremonial or art object.) 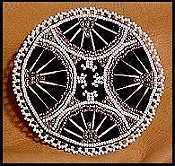 For beaded leather arts, Indian craftspeople sew the beads onto a leather backing (or cloth, today). Each bead may be sewn on individually, or they may be attached in loops or rows of beads (as in the classic Plains Indian "lazy stitch" beadwork style.) 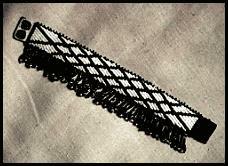 To make beaded strands, a craftsperson stitches the beads together into strings or a mesh using sinew, thread or wire. Normally this is done by hand, but some tribes used bow looms to turn these strands into beaded Indian belts or rectangular strips of beadwork. Beading strands and beading onto leather are both very complicated, time-consuming and delicate tasks which require many years of practice to do well. 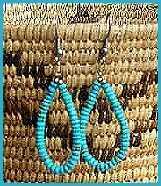 If you are looking to buy beaded art that was actually made by Native Americans--either because it's important to you to have the real thing or because you want to support native people with your purchase--then here is our list of American Indian beaders whose artwork is available online. 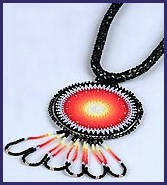 If you have a website of Indian beadwork art to add to this list, let us know. We gladly advertise any individual native beader or native-owned beading store here free of charge, provided that all beadwork was made by tribally recognized American Indian, Inuit, or First Nations artists. Thank you for your interest in Native American beadwork! On our main site we do our best to avoid slowing down our page loading with graphics, but this page is about Indian beading art, so we'd really be remiss in not showing a few beadwork pictures to give you an idea of their beauty. All photos are the property of their respective beadwork artists; please visit their sites to see their work in more depth. 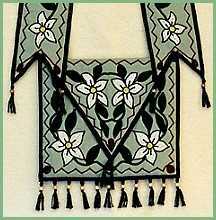 Artistic Cherokee Indian beadwork including beaded belts, sashes, and bandolier bags. 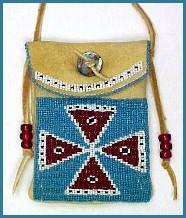 Native American Indian beaded buckskin and elk hide bags, purses and parfleche by Shoshoni and Arapaho artists. Native American beading designs by Tlingit artists. 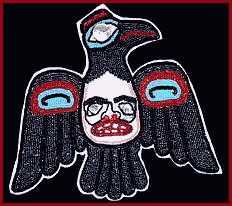 The raven to the left is beaded onto a felt backing, for artistic display. 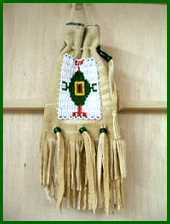 They also carry handmade beaded medicine bags. This Dakota Sioux couple beads leather pouches, bags, and knife sheaths in Plains Indian styles. They also make deerskin-backed beaded bracelets. Plains Indian beaded jewelry handcrafted by Blackfoot artists, including peyote stitch beadwork necklaces like this one, beaded deerskin bracelets, and hair pipe chokers. Traditional West Coast beaded jewelry featuring abalone, dentalium, and other shell beads, for sale from a California Indian cultural organization. 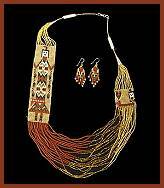 Heishi and hand-woven American Indian bead jewelry from a Navajo tribal art enterprise. This Zuni-Cheyenne couple make beaded jewelry in Pueblo and Plains Indian styles, also hairpipe chokers and beaded hatbands. Most of their work is custom orders though they do have some pre-made beadwork for sale. Shoshone beadwork necklaces and belt buckles from the Wind River Reservation. Contemporary beaded jewelry by a Red Lake Ojibwe artist. Email her for prices. Northwestern Native American beadwork designs on bracelets and medallion necklaces. This Mohawk woman makes Native American beaded earrings and rosettes from porcupine quills and beads. Most of her work is by commission only. 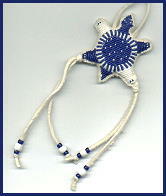 These are traditional Arapaho beadwork amulets for keeping a newborn's umbilical cord and bringing him or her good luck. A great baby gift! More Plains Indian beadwork amulets for baby's umbilical cord, by Blackfoot artists. They sell beaded keychains, too. Finding fully beaded Native American regalia for sale is almost impossible. It takes more than a year to fully bead a long dress or other traditional outfit, and nobody goes to this trouble unless it's been specifically requested (usually by a family member). Furthermore, no one ever sells their own regalia which has been specially made for them; that would be disrespectful. There are several good native artists from whom you can custom-order beaded moccasins, however. If you admire their work enough, perhaps you could approach them about beading you a different piece of regalia. Or, you can have a look at our Native American Regalia page, where there are dresses and shirts with beadwork accents and traditional embroidery available for sale. I think this is the only non-tribal artist we have linked to anywhere on our art pages. This couple (the man is unenrolled Ojibway, his wife is non-native) have been involved with and accepted by the native community for many years and provide invaluable educational services to us, so I feel they deserve a place here. 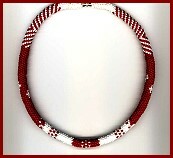 These wampum belts and jewelry are reproductions of traditional styles, using acrylic wampum beads rather than quahog. This Lumbee Indian family makes wampum jewelry out of single pieces of quahog shell. The jewelry is made in a different kind of style which is not traditional, but it is made out of real quahog and is very nice looking. 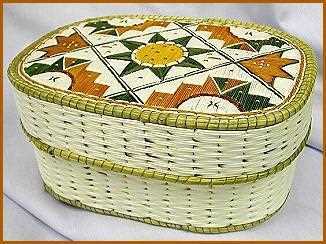 Though the traditional embroidery of clothes and bandolier bags with porcupine quills is a lost art today, contemporary native artists still weave beautiful quill boxes, baskets, and jewelry today. Visit our Native American Quillwork gallery to see some of them. The Huichol Indians of Mexico have a different tradition of beadworking, in which they coat objects such as gourd bowls and ceremonial masks with beeswax, then press beads into the wax to make colorful beaded designs. 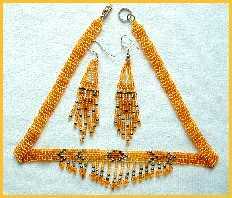 This Quapaw artist carries a terrific assortment of Czech seed beads which you can buy online. This Iroquois-owned beading craft store has an eclectic collection of seed, bugle, crow, pony, brass, and specialty beads, as well as quills, jingles, and other items. This Nanticoke family sells glass, tile, metal, and bone beads, including bone and horn hairpipe. 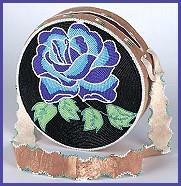 Extensive instructions on native beading crafts, especially Woodland Indian beadwork. Native beadwork patterns of the Southwest presented for beginning beaders. Outstanding exploration of Plains Indian beadwork, quillwork, clothing and culture. Many photographs. Beautiful book showcasing Native bead work and jewelry from different tribes. Many photographs. History and design of Dakota and Lakota Sioux beadwork. Illustrated description and history of Crow beadwork. Book on the history and artistry of Navajo Indian beadwork. Native American beading pattern book featuring Sioux, Crow, and Cheyenne beadwork designs. Sacred Seeds: Native American Beadwork: Information, photo galleries, and how-to articles by an Ojibwe beader. NativeTech Beads and Beadwork: Meaning, history, and techniques of American Indian beadwork in various tribes. Native American Beads and Beadwork: Article by a Lakota Sioux author about native beading arts in different North American tribes. Illustrations & Descriptions of Wampum Belts: Information and pictures of Iroquois wampum belts from the Tuscarora tribe. Wampum History and Background: Articles and photographs of American Indian wampum beads. What Is Heishi? : Article on the history and crafting of Native American heishi beads. Brilliantly Beaded: Online museum exhibit featuring photographs of Northeast Native American beadwork. Little Spirits on a Thread: Online museum collection showing the floral designs of Metis, Ojibwa and Cree beadwork. Otsinigo: Photographs and articles about Iroquois beadwork. Native American Bead Looms: Illustrated article on Indian bow looms, including a pattern for how to construct one. About us: This website belongs to Native Languages of the Americas, a non-profit organization dedicated to preserving and promoting endangered Native American languages. We are not artists ourselves, so if you are interested in buying some of the beadwork featured on this page, please contact the artists directly. Though we have featured only Native American bead work identified with the name and tribal affiliation of each artist, we haven't called the tribal offices to check up on any of them, and we only know a few of them personally. We also don't guarantee any of their products. This is not an exhaustive list of American Indian beading stores--if you would like us to add your beadwork to this page, please contact us with your URL and tribal affiliation. We advertise any individual native artist or native-owned art business here free of charge. We do not link to beadwork which is not made by tribally recognized American Indian, Inuit, or First Nations artists, so please do not ask us to. And finally, websites do occasionally expire and change hands, so use your common sense and this general rule of thumb: if the creator of each individual artwork is not identified by name and specific tribe, you are probably not looking at authentic American Indian beadwork.